I love it. It’s the start of a new year and my Pilates and Yoga fitness classes are full, both the ones I’m teaching and the ones I’m taking. Everyone is brimming with energy and hope, intending to be healthier this year. The excitement has infused new life into me. Exercise is a very important part of overall health but what you eat also plays an essential role in physical well-being. A good portion of my life is spent preparing meals. The thing is, I don’t want to spend a lot of time in the kitchen. I went to the grocery store looking for something different to make as a side dish, that was healthy, seasonal and easy to prepare. Some winter squash get all the glory: butternut, spaghetti, acorn, pumpkin, they get their fair share of promotion but what about the kabocha, have you tried that yet? This green marvel surpasses the pumpkin in flavor and color. Yet, when was the last time you had one as part of your meal? 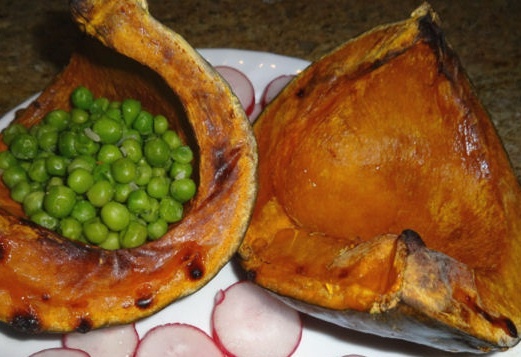 Kabocha needs no flavor enhancers, it is perfect simply roasted with nothing added to it. 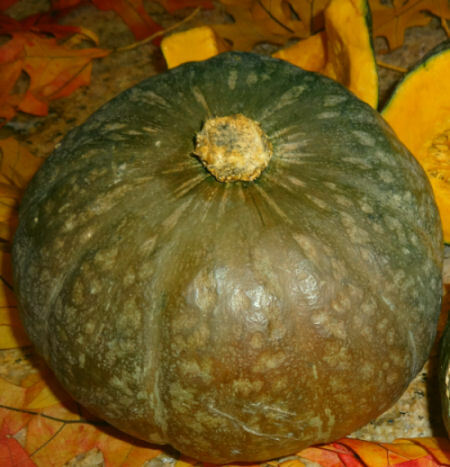 Opening the kabocha, you will immediately notice the vibrant yellow-orange color inside. It looked so inviting, I had to taste it raw. It is one of the few squash varieties that taste good raw, similar to the taste and consistency of a carrot. These simple roasted kabocha recipes are as easy as one, two, three. The prep time is less than 5 minutes! Got to be grateful for that, right? 1) Pre heat your oven to 375°. 2) You will need a very sharp knife to split open the kabocha squash. Cut the squash into fours; scoop out the seeds and stringy membrane. Coat a roasting pan or cookie sheet with oil and add 4 tablespoons of water. 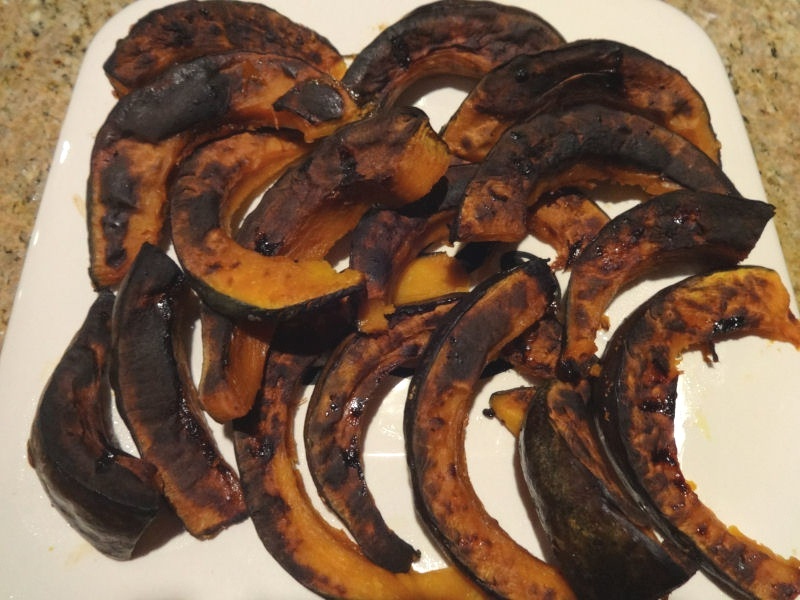 3) Bake squash for 50 minutes at 375°. When the squash is finished and slightly cooled, it is ready to be served. Spoon the sweet flesh off the skin and into your mouth. You could add a sprinkling of cinnamon on top or some buttered peas but Kabocha is equally delicious with nothing on it. 1) Pre heat your oven to 375°. Using a sharp knife, cut your kabocha in half. scoop out the seeds and stringy membrane. 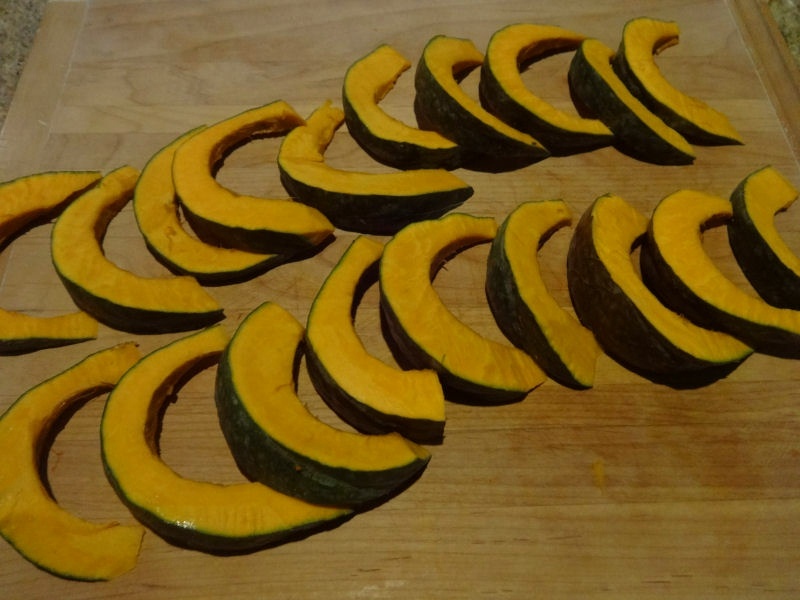 Cut the squash into crescent shaped slices (about 1/2 thick in the center). Coat a roasting pan or cookie sheet with oil and add 4 tablespoons of water. 3) Bake squash for 50 minutes at 375°. Then broil for 5 minutes or less. Keep a close eye on the squash. 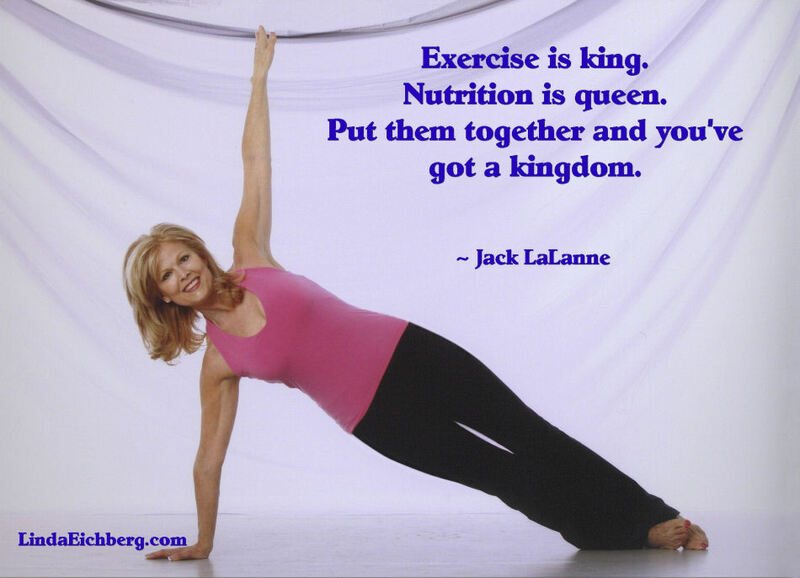 Let’s keep exercising and eating fresh seasonal fruits and vegetables for our physical well-being. But going further than that, well-being extends to satisfaction in our career, finances, family life, social and spiritual life. Connect to the One who knows us best. By spending time to ask God about the direction of our lives, we can connect with our Creator in meaningful ways that will give us true fulfillment, happiness and over all well-being. Our foundation is in the love of our Father, God, and our futures are with him now and beyond this world. My hope is for us to walk in the joy and freedom that Christ gave up his life for. We are blessed. Disclaimer: This is a personal blog. Always seek the advice of your health care professional. © All rights reserved.